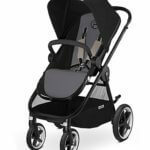 Cybex Agis M-Air3 Stroller Review – This is a stylish & luxuries stroller in the market; it has many good features like: deep recline seat, large canopy & storage basket; all wheel suspension system & car seat adaptors as well as bassinet option. 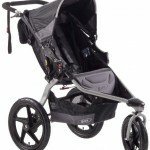 This is a daily use stroller, compatible for urban life style; it can accommodate a child from birth to 55lbs. It rolls on three hard rubber wheels with 6″ in the front and 9.5″ wheels in the back. 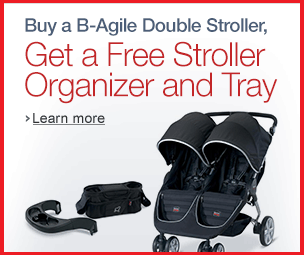 These wheels are designed for everyday life like going to the park, mall, or running errands. The front wheel is double and can be locked straight for rougher terrain. 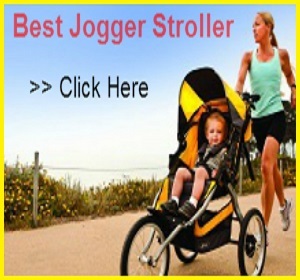 This is not an all terrain stroller but it can run on some light uneven surface or rough surface. It has all wheel suspension system which makes the ride safe & can absorb bumps to give a smooth ride. 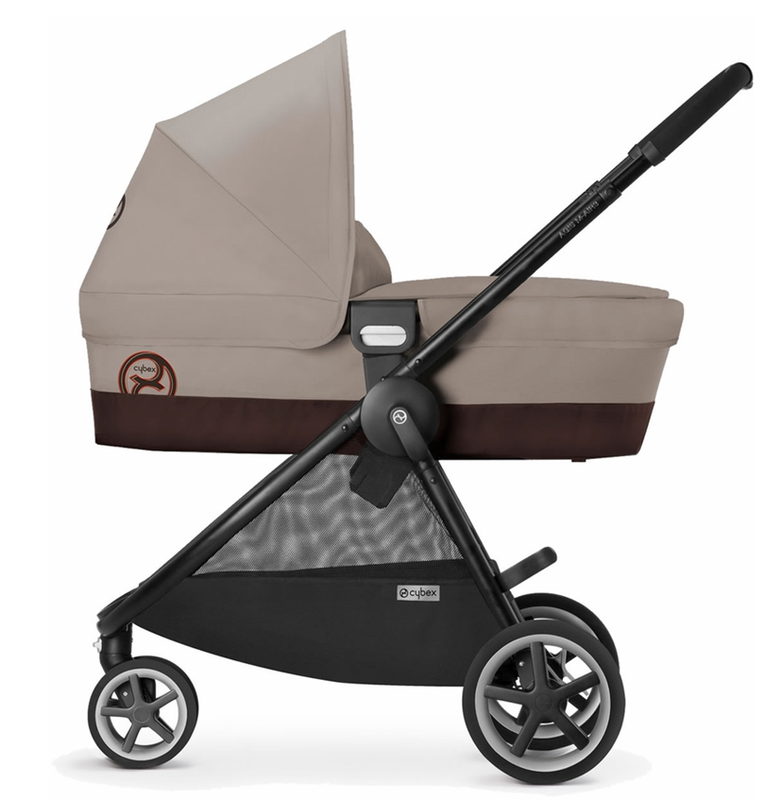 The seat is 13.5″ wide with a 20″ seat back and a measurement of 26″ from the back of the seat to the top of the canopy. The seat has a strap recline systemand goes to almost a flat position suitable for a newborn. You will need one hand to recline the seat and both hands to bring it back. For infants you can use infant car seat adaptor, You can put the car seat on top of the main seat without removing it, or you can remove the seat and put the car seat right into the frame. 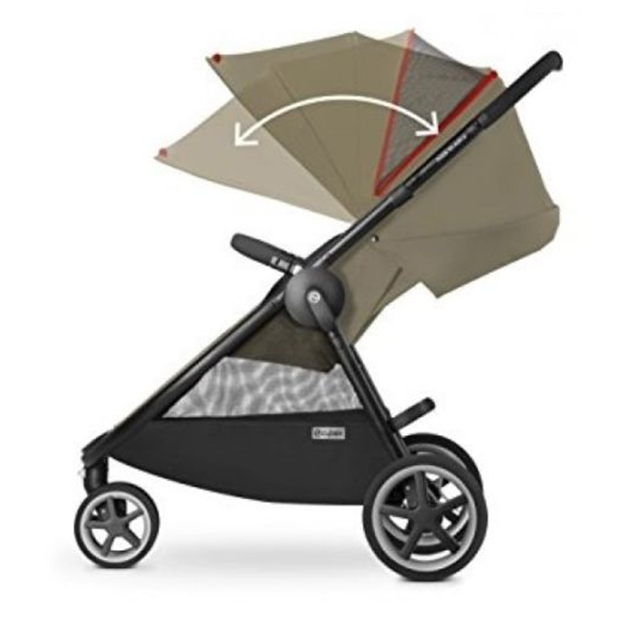 To make a bed like environment you can replace the seat with a matching bassinet called Cybex Carry Cot M.
The bassinet also has UVP50+ sun canopy to protect your baby from sun, wind and rain.The carry cot weighs only 8 lbs and can accommodate a child from birth and up to 20 lbs. 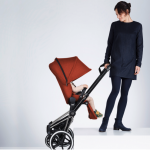 It has a large three-panel canopy with one mesh zipped-in panelproviding full coverage to your baby & prevents from harsh weather. There is no pee-ka-boo window but there is one mesh which works like a two in one tool , you can see your baby through it as well as it helps for ventilation in hot summer days. It has an adjustable padded 5-point harness with a center release buckle which is very easy to lock & unlock.It holds your baby tight & safe. 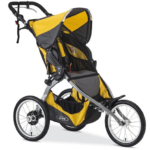 It has adjustable telescoping handlebar which goes from 37″ up to 42″ from the ground, which is really a great feature for shorter & taller parents. 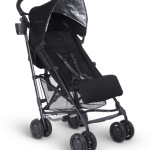 “Cybex Agis M-Air3 Stroller” has one swing-away removable bumper bar. There is one foot brake is located between the rear wheels which is very easy & friendly & safe enough to control the speed. 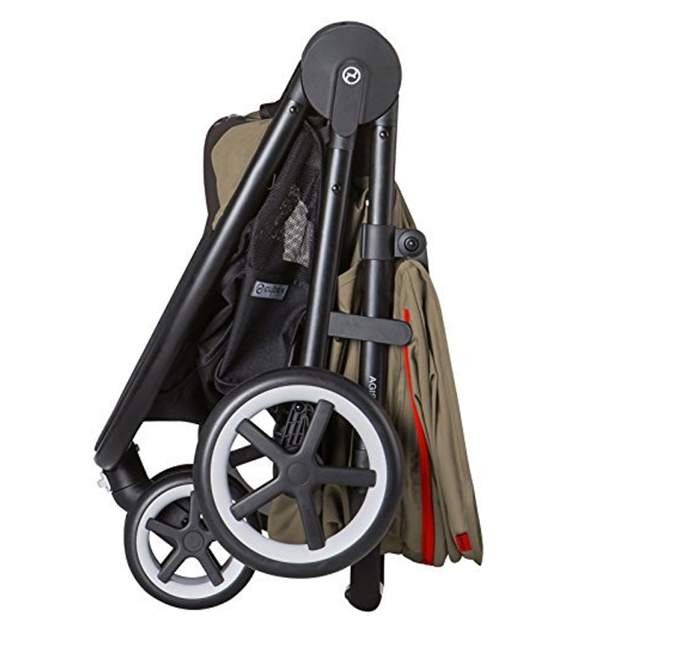 Fold is very easy, you can fold this stroller with on hand only all you need to do is to pull on two straps located in the middle of the seat and the stroller will fold in half. The fold is very compact and there is an automatic lock and standing fold. I like the basket as it’s large but it’s not that much easily accessible because of the cross bar, you can put large diaper bags & other stuffs easily. The seat material is very soft & comfortable, easily washable, all the materials made from chemical free fabric so that it doesn’t affect baby’s sensitive skin. The Cybex has a 2-year warranty from the original date of purchase and you have to be the original owner. 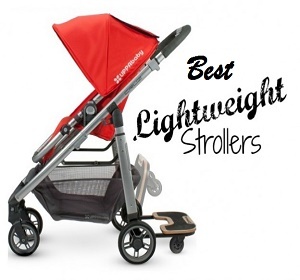 You can have this light weight stroller for daily use as it has all the required features to make your baby’s ride safe & easy. I didn’t find any cons that can stop you for investing in this stroller, your baby will get a happy & memorable ride, so just g o for it.